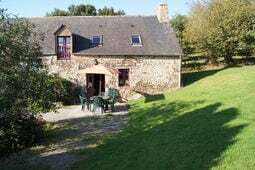 Self-catering Gîte with 3 bedrooms and 1 bathrooms. Sleeps 9. Saturday changeover. Self-catering Gîte with 13 bedrooms and 11 bathrooms. Sleeps 33. Non-applicable changeover. Self-catering Gîte with 6 bedrooms and 3 bathrooms. Sleeps 12. Saturday changeover. Self-catering Gîte with 3 bedrooms and 2 bathrooms. Sleeps 4. Saturday changeover. Miles of coastline and countryside, including the beaches of Normandy, the rocky peninsula of Brittany and, the banks of the Loire and Atlantic coast. An area loaded in history and tradition with glamorous seaside resorts, remote fishing villages, fairytale chateaux and idyllic countryside. There’s a rich gastronomy and plenty of places to visit so it’s ideal for romantic and family holidays. Rugged coastlines change to sandy beaches in the North West corner of France, including Brittany, Normandy and Pays de la Loire. 800 miles of rocky, rugged peninsular coastline with beaches, bays and traditional fishing villages. Celtic influence and history with distinct Breton language and soul; numerous colourful festivals. Enchanting countryside with megaliths, wild meadows, castles, manor houses, chapels and villages. Farming country specialising in fish, seafood, crepes, dairy produce, and honey. Very child-friendly; activities include sailing, windsurfing, swimming, sea and freshwater fishing, golf, canal boating, riding, walking, cycling. Find out more about Brittany and search for holiday properties. Charming ports and sandy beaches including fashionable seaside resorts of Cabourg, Trouville and Deauville. Historical region of William the Conqueror, home of the Bayeux tapestry and site of famous WWII landing beaches, museum and memorials. Idyllic countryside with dairy farming, apple orchards, ancient beech forests, meandering valleys and wooded hillsides. Gastronomy features Calvados brandy, seafood, cheese, cream, duck, apples, pork. Sailing, sea festivals, golf, cycling, equestrian, children’s activities. Find out more about Normandy and search for holiday properties. Magnificent Loire river flowing through lush countryside. Fairy-tale riverside chateaux and gardens open to public, some with Son et Lumière. Atlantic coastline with long sandy beaches, quaint bays and islands. Castles and museums, especially in picturesque Angers, Saumur and Nantes. Swimming, sailing, fishing, boat hire, buggy racing, equestrian, motor racing at Le Mans. Gastronomy includes seafood, game, vegetables, cheeses, fruit tarts; many fine restaurants. Find out more about Pays de la Loire and search for holiday properties.